The growing concerns about the stability of the countries of the Middle East and North Africa (MENA) because they make significant contributions to world oil supply adds additional meaning to these weekly posts on the world’s major oil producers. To briefly recap I looked at the top tier oil producers (as listed by the EIA (i.e. those who produce more than 3.1 mbd in 2008) in the first post of the series. (These were Russia, Saudi Arabia, the United States, Iran, China and Canada. ) In the second I looked at the next four countries on the list, namely Mexico, the United Arab Emirates (UAE) Kuwait and referred to Venezuela – subject of a series of posts earlier in the year. The third post covered Norway, Brazil, Iraq, and Algeria. And so now we move on to look at Nigeria (2.35 mbd), Angola (2.0 mbd) Libya (1.87 mbd) and the United Kingdom (1.58 mbd). 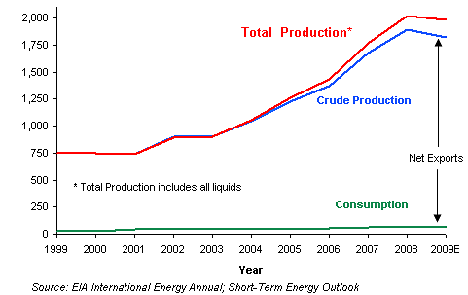 The numbers in parentheses are the production numbers cited by the EIA for 2008. To further put these countries in context, these take us down to number 18 on the list, and with one more post I will have covered all the countries that produced more than 1 mbd on average in 2008. 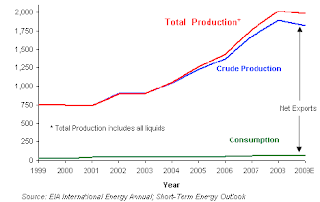 I will start with Nigeria, which now is cited as producing 2.4 mbd of crude and condensate in January 2011. The country has been having considerable trouble with sabotage and internal unrest, which has had a negative impact on production. However the country signed an Amnesty Program with militants in 2009 which has reduced disruption. As a result in February Nigeria was able to raise production to 2.6 mbd. 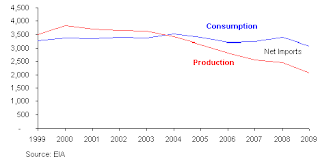 If this can be sustained it will bring production back over the peak level that was achieved back in 2005. Note that, for crude oil production alone, Nigeria is listed as producing 2.17 mbd in January, according to the February OPEC MOMR. (Which is also a gain from the above chart). In light of some of my recent comments on who might be hurt if oil production in some of the MENA countries drops off, it is perhaps interesting to note which countries got oil from Nigeria in 2009. Historically Nigeria flared much of the gas that was associated with the oil, particularly in the Niger River Delta, where much of the oil is found. That practice led to some of the more dramatic stories that came from the region, before the amnesty. There is, however, a concerted effort now to capture and market this natural gas, as well as that which comes from gas wells in the country. This has led to some optimism by the Government over future sources of revenue. The Minister also disclosed that the establishment of two new Liquefied Natural Gas, LNG plants, in Olokola in Ogun/Ondo States and Brass LNG in Bayelsa state, will create over 7,000 jobs and inject over $1billion into the host communities. With Nigeria having increased overall production since 2008, though potentially having limited potential for much greater increase, the next country down the list is Angola which, since 2007, is also in OPEC, and OPEC list the January Angolan production of crude at 1.62 mbd. 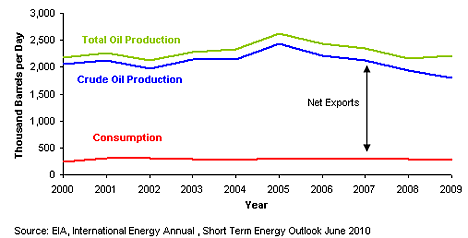 This is significantly below the overall 3.8 mbdoe that BP has reported for total energy production in 2010. Because of some technical problems with water injection, being used to help move oil from the reservoirs, moves to address the problem might overall, reduce the average for 2011 to 3.4 mbdoe. Angola exports about 1. 7 mbd of oil, but is responsive to OPEC requests to control production in order to keep prices at the OPEC comfort level. (Which has risen from around $75 to over $100/bbl in the last few months). 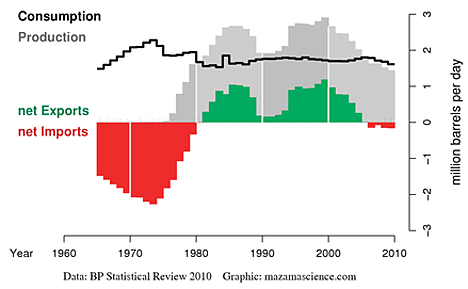 Thus the declines shown in the EIA plot below, which only shows through 2009, are more politically induced than due to geological conditions. The EIA, for example, lists project for this year alone that are expected to add 650 kbd to production, and likely export. Unfortunately we are now far enough down the list that while these numbers are significant in their own right, and for the country they may not give that much help to the overall shortages that may evolve over the next year. Angola currently is building an LNG project at Soyo, expected on stream in 2012 which will handle around 1 bcf/day. Apart from the LNG, which will be exported, the plant will send some 125 mcf/day of natural gas into a distribution network for domestic consumption. Until the plant comes on line most of the almost 1 bcf of natural gas that is produced every day is either flared or reinjected to help with oil production. Trying to project Libyan future production is rapidly becoming meaningless, I fear as the initial moves to remove the current Leader have not met with sufficient success to eliminate the possibility of civil war. It was only a few weeks ago that Libya was producing at around 1.6 mbd of oil, and Luis de Sousa has reposted an earlier review of the past history of their production. He presciently notes in that post that the rising population of the country is going to demand more of the resource be spent at home. The topic of Libyan production will likely continue to appear in other posts – as it just has – but at the moment it appears, for a variety of reasons, that the system is effectively shut down. Little if any oil can be shipped out of Libya because most ports were closed. Meanwhile, storage tanks were filling up rapidly. Oil traders said one major oil company cargo ship was supposed to berth this week, but no one was at the port to deliver an oil shipment, and shipping companies were reluctant to send ships into the Libyan ports. I have also discussed elsewhere the likelihood of sufficient increase in production in other countries to make up the shortfall. Gazprom has been helping Italy, for example, and Saudi Arabia increasing production, but how long this will last, and how much will ultimately be needed remains an unknown. It really depends on how many dominoes fall, and how long they remain on the table. 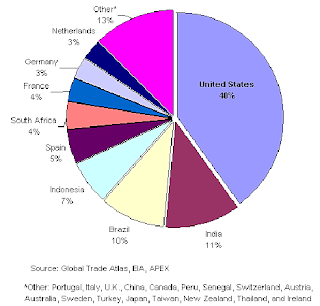 Which brings us to the United Kingdom. Back in the troubled days of the first oil shocks some thirty to forty years ago, it was the combination of new production from the fields in the North Sea and the North Slope that helped bring oil prices down to the low level which allowed the years of growth until now. 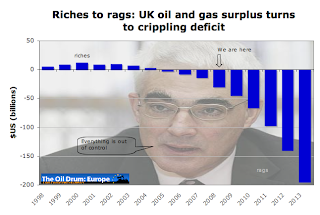 But we have reached a point where those resources are beginning to disappear, and the UK has turned from an energy exporter to a growing importer. Euan Mearns has documented this progression in a much more detailed and better way than I illuminating, for example, back in 2008, the coming seriousness of their problem. 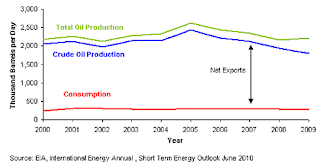 In 2010, the UK produced 850 million barrels of oil and gas equivalent (boe) or 2.3 million boe per day. Current plans now target reserves of 11.6 billion boe, 1.3 billion boe more than was anticipated a year ago, reflecting the outcome of increased exploration and appraisal activity across the UKCS and particularly West of Shetland. Oil & Gas UK believes there could be up to 24 billion barrels of oil and gas still to recover from the UKCS. This was about 60% of the UK energy need. Production of crude for last November was 1.047 mbd from offshore, and 9,344 bbl from land wells. The natural gas numbers were 2.7 Bcf from offshore oil wells (as associated gas) and 2.8 Bcf from offshore gas wells. In addition there was some 12 kbd of condensate from the offshore gas fields. 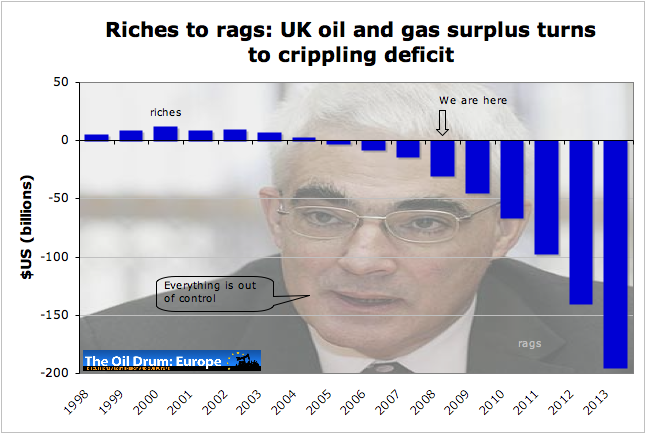 The UK is clearly entering a more expensive future as it must find more oil from overseas, just as that supply is tightening. On the other hand, while the situation is getting somewhat worse more rapidly with natural gas, as the EIA plot below shows ( and it contributes to Euan’s total figures) there is a sufficient glut on the world market at the moment that there will not be that immediate a problem in the short-term. 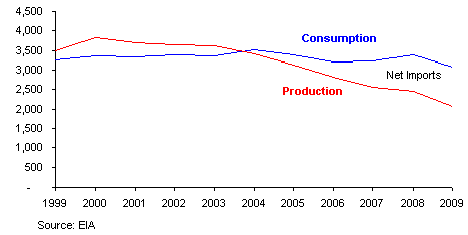 Drawing on research conducted for the previous government by Lord Stern, Huhne argued that a $100 a barrel price is the exact point at which the economics of climate change pivot so that it becomes cheaper for British consumers and businesses to invest in green technology than remain with the status quo. He said that if oil only reaches $108 a barrel by 2020 as predicted by the US Department of Energy, which would also lead to higher gas prices, then "the UK consumer will win hands down". He said the UK consumer would be "paying less through low-carbon policies than they would pay for fossil fuel policies". This does not recognize that most renewable energy technology currently focuses on generating electricity, while the crisis is in liquid fuels for transportation, and it also ignores the likely over supply of natural gas which is separate that price from the rising price of oil over the coming years. Tsk! The current situation in the MENA countries is in such a state of flux, and the impacts barely recognized as yet, that it is becoming even more difficult to have any confidence that the predictions of performance that were being used only a couple of months ago will continue to have much validity in predicting what is likely to occur even in the relatively short term future. If I may ask, could you have a print option for your blog ? Your posts are always very informative and insightful but that's the kind of writings which are better appreciated in paper form, in the comfort of an armchair or a sofa. Ah, thanks for the suggestion - I will have to find out how to do this, which due to the pressure of a couple of things may take a day or two. Sorry had never thought of it. I do not understand your graph. Sanjay Precision - Gear Blanks offered can be made accessible in both standards just as nonstandard designs according to clients illustrations and details. Coming in development material decisions of carbon steel, combination steel, and others, these can be offered in various statures and distance across decisions with use reasonableness in territories like substantial mining gear and others.